It is reaching that time of the season where we are starting to get finales of the series out there. Some will be great. Some will be awful. Some will be somewhere in between. There will be some that are ending the series itself. Last week saw the ending of the first season of 24 Legacy. I found it to be reasonably entertaining, and I did appreciate the few episodes than the normal 24. 24 Legacy had 12 episodes and ended with a satisfactory conclusion. Stand out performer of this final show was clearly Jimmy Smits as Senator John Donovan and his crooked father Henry played by Gerald McRaney. This pair brought the drama to 24. I should also throw out a shout out to our new special agent, Eric Carter, who survived a throwdown with the one and only Tony Almeida. There were times that I thought 24 Legacy was taking a stupid path, but on the whole, the story was done well and I would be up for a second go around with this crew. Also ending this week was Trial and Error, the half-hour comedy starring John Lithgow. This series started off in the uncertain column for me, but I have to say that I really found myself enjoying this. The jokes that I thought might become stale (such as Sherri Shepherd’s countless problems) worked almost all the time. The compulsion to have to walk backwards was just a funny sight gag and I laughed each time Shepherd did it. We received a verdict (Guilty) and discovered what really happened to Lithgow’s wife (she was killed accidentally by an owl). I don’t know if this series is coming back for season two, and I am not sure I want it to come back. This first year was really great and trying to recapture the humor with a second murder investigation might be going too far. This coming week will see the series finale of Bates Motel and the season finale of the anthology series Feud: Bette and Joan. Both of these shows have been spectacular. Bates Motel does not get enough credit and I cannot wait to see how the show wraps itself up. Alex Romero kidnapped Norman from right out of the police station so I am expecting some serious fireworks. 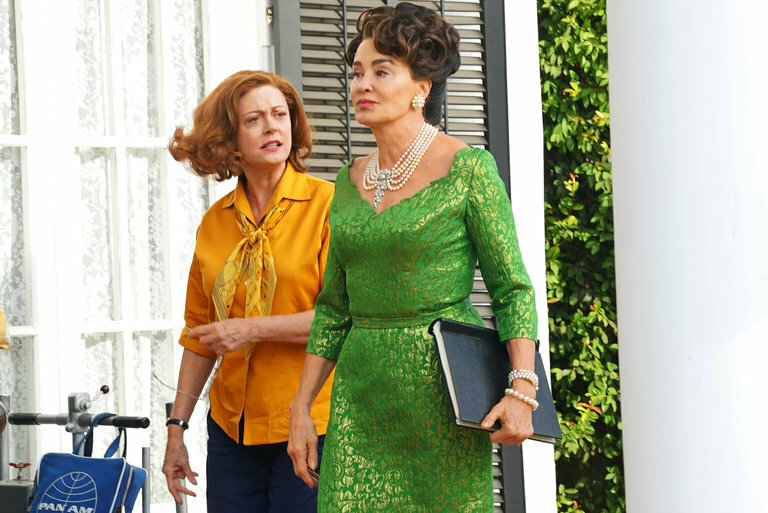 And Jessica Lange has been brilliant as Joan Crawford this season on Feud. There is just no way that she should not win the Emmy for this role. And Susan Sarandon has been no slouch either. Getting lost among the two divas is Alfred Molina who has also been just tremendous. We have found out that season two of Feud is a go, with the title being Feud: Charles and Diana. We also got an important debut this week as Fargo returned with its first episode. Just as the past seasons, we get to meet a crew of oddball characters who are being placed in terrible situations. We meet the brothers, Ray and Emmit Stussy, played by Ewan McGregor. They are in an argument over a stamp and things escalate to ridiculous levels. Fargo has shown itself to be a darkly comedic romp through the (usually) snow covered landscape of the northern Midwest, and, with the murder of one of the characters by falling air conditioner, this season looks to be no exception. And are there more aliens coming? On Scandal, the show has done what I was desperately hoping that it would not. It has reunited Olivia and Fitz. Ugh. Seriously, I just want those two to go off somewhere and never come back (Vermont, perhaps.) Meanwhile, despite all of the attempts to stop it, Mellie Grant was named the President of the United States by the Electoral College, apparently with the fix in. Our two villains of the season, Peus and Ruland, are really cartoon characters and I almost laughed when the blonde haired woman started bashing the brains out of Elizabeth North with a golf club. Mellie did all she could to salvage that scene with her normally excellent acting, but there was only so much she could do. The first half to two-thirds of this season had been great, but I feel like it has slipped into poor patterns. Big news in the world of Movie Trivia Schmoedown as we have a brand new Movie Trivia Schmoedown Champion. “Yodi” Mark Reilly defeated “The Outlaw” John Rocha in a championship match on Collider Video’s You Tube channel this past Friday. Rocha failed to answer the final question that would have given him the win (much like when Dan Murrell lost to Rocha) and the title went back to Reilly. Reilly became the first two-time Schmoedown singles champion. Commissioner Kristian Harloff announced Reilly would defend against Murrell at the next biog event, The Collider Collision in July, however, there has been some speculation that Rocha would be added to that match to make it a triple threat match. Tragedy on Agents of SHIELD as we continue to discover that, even though our heroes are alive in the alternate reality of the Framework, they can still die as we saw the death of the Patriot, Jeffrey Mace. Mace died a very heroic death, holding up a building long enough for the children inside to escape, but the collapsing ceiling finally did hm in. Agents of SHIELD continues to bend reality in the Framework (Hello! Welcome back, Trip!) but the fates of these characters are seriously in doubt. Could there be another loss inside the virtual reality world? Riverdale returns this week. Fargo continues. WWE Payback is April 30th only on the WWE Network.